Rifle scopes are the premier tool in a hunter’s arsenal of gear. There are few non-scoped hunts and those usually involved a non-bolt action rifle. It can be difficult to choose a scope when there are so many out there and they all bring varying levels of difficulty. This holiday season, many rifle scopes will be on sale. Since most hunts can’t be done without them, look to save big on a rifle scope that will ensure you, your relative or a friend go home with a kill. If you don’t see a rifle scope that you like below, check out our picks for the best rifle scopes of 2018. As we mentioned, there is a multitude of rifle scopes on the market and they each have their own variants and updated models. Here we’ll explore some of the best rifle scopes on the market. Click here for a full list of best-selling rifle scopes. 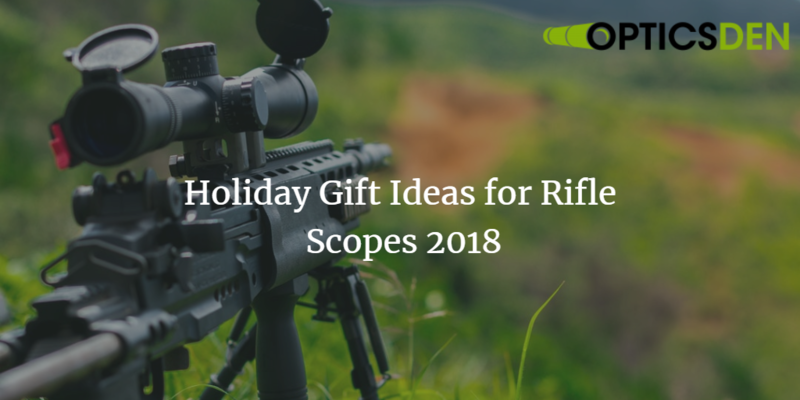 Do Rifle Scopes Make Great Gifts? The Vortex Diamondback is a rugged rifle scope designed to handle the elements and when conditions aren’t perfect. The optics will hold up in the worst conditions and so will the scope’s aircraft-grade aluminum body. Its applicable to guns other than a bolt-action. The BugBuster is an affordable tactical scope with a wide field of view and a comfortable eye-relief. Its rugged construction means its proven against water, fog, and the occasional drop. It has a number of rings and dials along the body to help you zero it in. The Nikon P-223 provides some of the best eye-relief for high recoil rifles on the market. This scope comes with built-in settings to eliminate parallax and help shooters acquire targets with specific reticles anywhere from 100 to 600 yards. The Prostaff is renowned long range scope that is easy to make adjustments to on the spot. Its optics are multi-coated for appropriate light transmission and elimination of glare. For the price, the Prostaff is well worth it. The Viper is a premier scope perfect for the long range hunter. It helps calculate windage like most rifle scopes but also estimates range and bullet holdover after firing. Like the Diamondback, it too has a rugged outer coating for less than ideal conditions. The most expensive scope of our list is the German-made Conquest. It has an HD lens system for above average image quality for targets up to a thousand yards, well out of the range of most rifle scopes. For the price, the Conquest pretty much provides the best optics in the field. Rifle scopes are obviously required if you’re hunting game at long range. They’ll make great gifts this holiday season. If you take good care of them, there’s little need to keep replacing them year after year. Some rifle scopes are going to do better at different ranges but there shouldn’t be a necessity for more than a two or three. You’ll also want to consider which rifle scopes are compatible with your gun. The railing on top of the gun barrel will determine which rifle scopes are eligible.